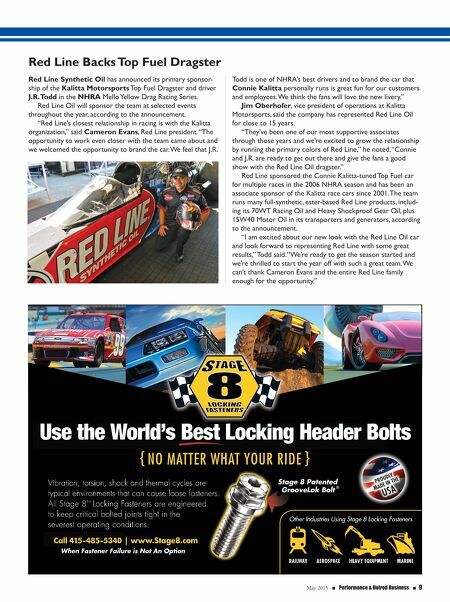 May 2015 n Performance & Hotrod Business n 9 Red Line Backs Top Fuel Dragster Red Line Synthetic Oil has announced its primary sponsor- ship of the Kalitta Motorsports Top Fuel Dragster and driver J.R. Todd in the NHRA Mello Yellow Drag Racing Series. Red Line Oil will sponsor the team at selected events throughout the year, according to the announcement. "Red Line's closest relationship in racing is with the Kalitta organization," said Cameron Evans, Red Line president. "The opportunity to work even closer with the team came about and we welcomed the opportunity to brand the car. We feel that J.R. Todd is one of NHRA's best drivers and to brand the car that Connie Kalitta personally runs is great fun for our customers and employees. We think the fans will love the new livery." Jim Oberhofer, vice president of operations at Kalitta Motorsports, said the company has represented Red Line Oil for close to 15 years. "They've been one of our most supportive associates through those years and we're excited to grow the relationship by running the primary colors of Red Line," he noted. 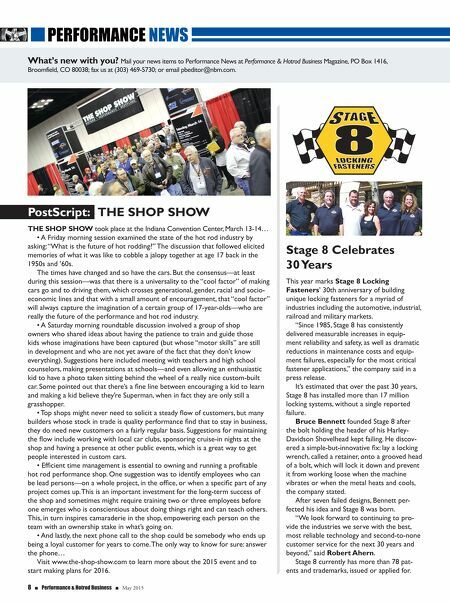 "Connie and J.R. are ready to get out there and give the fans a good show with the Red Line Oil dragster." Red Line sponsored the Connie Kalitta-tuned Top Fuel car for multiple races in the 2006 NHRA season and has been an associate sponsor of the Kalitta race cars since 2001. The team runs many full-synthetic, ester-based Red Line products, includ- ing its 70WT Racing Oil and Heavy Shockproof Gear Oil, plus 15W40 Motor Oil in its transporters and generators, according to the announcement. "I am excited about our new look with the Red Line Oil car and look forward to representing Red Line with some great results," Todd said. "We're ready to get the season started and we're thrilled to start the year off with such a great team. We can't thank Cameron Evans and the entire Red Line family enough for the opportunity."